The survey, adapted from a similar Business Roundtable national survey, provides a snap shot of the overall economic outlook index for various companies within the region. It also helps central Virginia companies anticipate business decisions and plan for growth. Randy Raggio, associate dean at the Robins School, administers the survey and collects the responses each quarter. 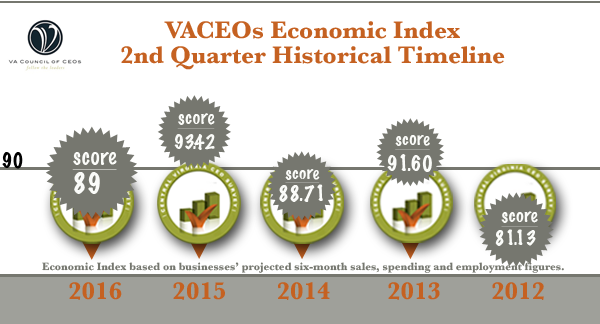 Overall, the most recent Economic Outlook survey reflects concerns over the upcoming election and sluggish economy among chief executives in central Virginia. The survey’s index, which measures executives’ views on projected hiring, capital spending and sales over the next six months, fell sharply from its highest ever level in Q1 2016 back to the long-run average. The survey has been administered quarterly since 2010. Says Scot McRoberts, executive director of the Virginia Council of CEOs, “I continue to hear guarded optimism among small business CEOs. They seem to be more guarded this quarter — with global uncertainty and a tumultuous presidential race,” said Scot McRoberts, executive director of the Virginia Council of CEOs. The executives’ revenue outlook remained strong with 67 percent of respondents expecting an increase in sales over the next six months, down only slightly from the 72 percent that projected an increase when surveyed a quarter ago. Thirty-eight percent of respondents expect sales to increase by more than 10 percent over the next six months, which is identical to the number last quarter. However, only 32 percent of respondents expect capital spending to increase over the next six months, which is down from 40 percent last quarter, while 57 percent expect capital spending to stay flat. Forty-eight percent expect employment to increase over the next six months, which is down from more than 60 percent last quarter, while 48 percent expect employment to remain flat. Next quarter’s survey will ask specifically about the election and the impact of Brexit on central Virginia companies. The Virginia Council of CEOs is a nonprofit organization, whose mission is to connect the CEOs of second-stage companies so they can learn from each other and grow their businesses. The Council is led by a board of directors, which is comprised of 7 members and the executive director. Currently, there are 190 CEO members. Sixty-five CEOs responded to the survey, and the average company had about $7.5 million in revenue for the most recent 12-month period. Multiple industries are represented in the sample, including construction, manufacturing, finance and insurance and retail). The average employment of companies whose CEO responded to this survey was about 44. The Robins School of Business is the only fully accredited, top-ranked undergraduate business school that also is part of a top-ranked liberal arts university. Bloomberg Businessweek ranks both the Robins School’s undergraduate and part-time MBA programs among the top 25 in the country in their respective categories. The school’s executive education division offers open enrollment courses and customized leadership development, training and consulting.